Only RC helicopters of the brand SAB (Goblin) are allowed plus modified, tuned or prototype ones which are based on the original SAB Goblin. 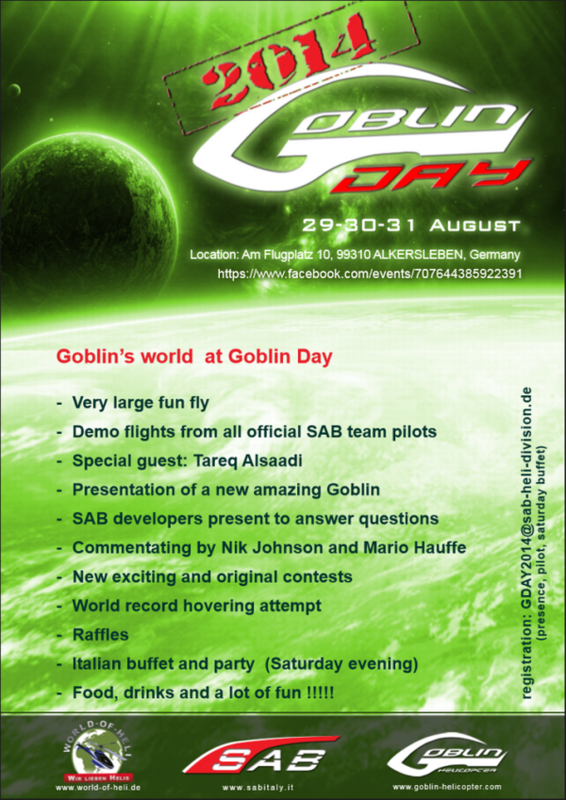 All Goblin pilots are welcome, no matter if beginner, intermediate or professional - everyone is allowed to fly even if he / she only hovers! It is important to register before. Extra tent for charging your batteries - bring your own power supplies and battery chargers! Registration tent: Only allowed to fly AFTER registration at the flying field! If you stay at the field with a tent or camper / motorhome, please leave a short note in the email. Discount for Airport Hotel Erfurt! When booking your room, leave a message with ,,Helikoptertreffen 14''. The team of World-of-Heli, SAB Heli Division & SAB Heli Division-Germany is looking forward to this event and is full of expectation on a memorable weekend together with you.